TOPAZ HORIZON: Knocking on your hearts again! I'm doing this for a friend's friend. I don't know who Girrard is but he's 16 years old and he has leukemia. That's all I need to know. I have sons. Seeing sick children, especially our own--nothing breaks a mommy's heart more! To help Girrard's fight against the monster in his body, his family and friends have started fundraisers. Today at 5:00 PM at Power Plant Mall, a special screening of The Bourne Legacy will be held for Girrard. A seat is P500. You get to watch the action movie shot here in Manila a few months ago, you get a special giveaway from the sponsors, and you get to help a young man live. It's a win-win for all! Speaking of winning, let me offer you a chance to win these tickets! 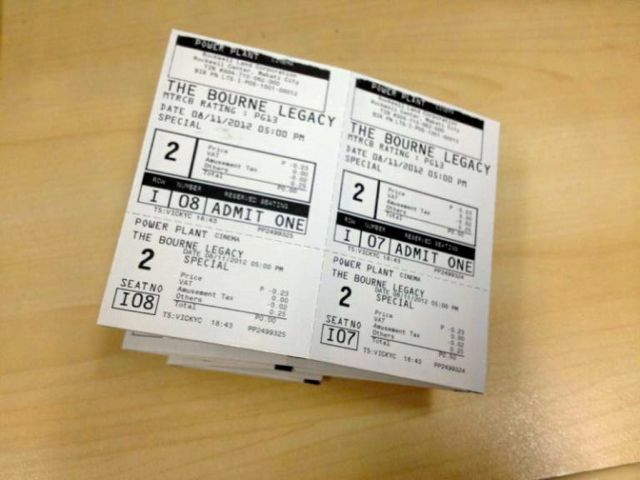 To support Girrard's chemo, I bought 2 tickets to The Bourne Legacy screening later. But since I'm a breastfeeding mommy, I can't watch movies yet. So I'm giving them away!!! Just email me at frances@topazhorizon.com. Subject of email is: "My legacy is to help Girrard!" Email me your full name and phone number. That's it! Your phone number is important so I can contact you right away. Remember: the screening is tonight! I'll text/call the winner at 3 PM! Yes, so you have until 2:55pm today to email me!!! Or you can just show up at Power Plant with your girlfriend, boyfriend, parents, friends, etc etc, buy tickets and watch the movie! Help Girrard in his fight! To know more, click here. UPDATE: I changed the deadline kasi raw to announce at 3pm doesn't give the winner and his/her date enough time to prepare to go out. Oo nga naman! So I'll text the winner at 12 noon! Thanks to all those who joined!